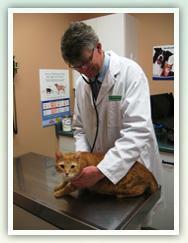 Coventry Animal Hospital Explains Why Chronic Vomiting in Cats is Not Normal! For many years, cat owners and veterinarians alike have accepted chronic vomiting in cats as a normal behaviour. Recent research has shown us that chronic vomiting is actually not normal and can be a sign that there is an underlying issue. Almost all chronic vomiting cats in a recent study were diagnosed with either inflammatory bowel disease or lymphoma through biopsy, both of which can be treated. If any of the following statements apply to your cat, you should speak with your veterinarian. My cat occasionally vomits hairballs. If your cat vomits hairballs more than twice monthly, it is not normal. Since cats are avid groomers, their digestive tract should be able to handle their own hair. If it is regularly vomiting up hairballs, this could be a sign something is wrong with its digestive tract. My cat only vomits when she eats too fast and will vomit up entire kibbles to show this. Cats, as obligate carnivores, normally do not chew their food. Therefore, it is normal for them to swallow kibble whole and is not a sign that they have eaten too quickly. If your cat is vomiting up food, it is also a sign that something may be wrong with its digestive tract. My cat has always been a “vomiter”. While this may be true, it is more of a sign that your cat has been dealing with a long term issue such as inflammatory bowel disease, rather than being normal for your cat. My cat is a chronic vomiter, what should I do? The first most important step would be to take your cat to your veterinarian. Your veterinarian will perform a thorough physical exam to see if there is anything abnormal that could be causing the vomiting. Next your vet may want to perform bloodwork or x-rays to rule out issues that can cause chronic vomiting such as liver, kidney or thyroid disease. Further diagnostic tests may be required such as ultrasound and biopsy. How is chronic vomiting in cats treated? Chronic vomiting is treated based on the cause. For example, with inflammatory bowel disease, treatment may include a change to a special hypoallergenic diet, probiotics and sometimes medications such as steroids. With treatment, most cats can do really well and significantly decrease the frequency of vomiting episodes. The sooner it is addressed, the better off your cat will be as any inflammation in the gut can increase the chance that cancer may develop in those areas. Contact our team at Coventry Animal Hospital if you have any questions or concerns about your cat.